Every loadout, in my opinion, needs to carry what I call the Big Three: Ammo, Hydration, and Tools (which includes BBs + loader, multitool, hop-adjustment keys, spare batteries, etc.). Everything else besides that is just for looks. This rig contains only the Big Three in a very high speed low drag type of setup, without the need for a separate first-line belt rig or anything on my legs aside from a holster for my sidearm (and if I really wanted to, I could mount a Blackhawk Serpa onto the fold-up bib to make the ultimate all-in-one rig). It allows for maximum flexibility and ease of movement, and is very light weight compared to my other setups which is great during those warm summer afternoon games. I got the rig from my buddy Joe who wasn’t using it anymore (thanks Joe! 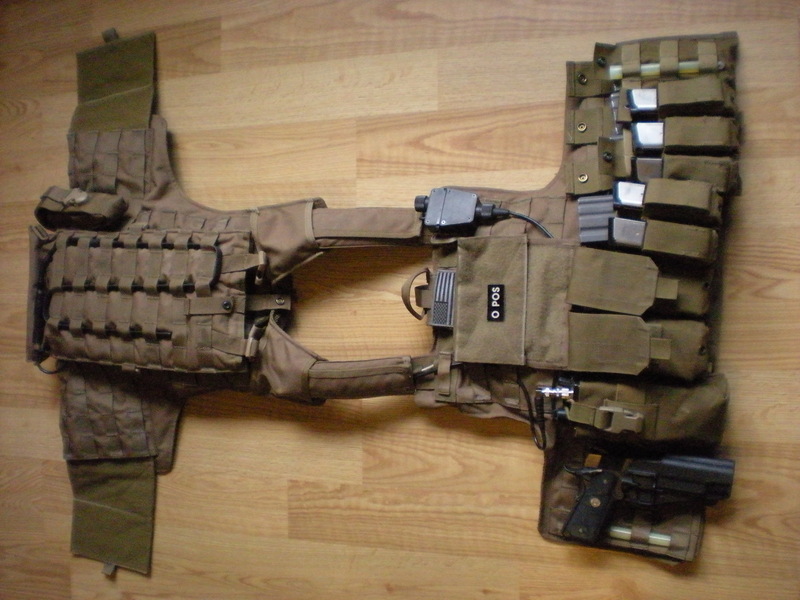 ), but I eventually wanna pick up a Pantac one so I can have the option of using my MBSS backplate with it (the buckles on this one don’t work with the Pantac buckles on my MBSS). Other than that, the rig is pretty much done. “Heavy” rigs with tons of bells and whistles look great (especially for impressions, obviously), but every now and then it’s nice to toss a light rig like this on and go run around a bit. Until recently, all 3 of my AR builds have been military-based. I’ve generally maintained one civilian style AR build out of my 2-3 AR’s in the past… and I miss having a civvie gun. Lately I have been spending quite a bit of time trying to figure out what I should build next – I think I’m going to go with something a little simpler than my usual RIS/RAS. At the moment, I’ve got a spare T-1 clone, Daniel Defense rear sight, triangle front sight, MIAD pistol grip, and PTS AAC 51T flash hider on my KA M4 CQB AEG. I’m already pretty close to what I want from this build – I just need a tightbore, outer barrel, gas tube, and handguard. 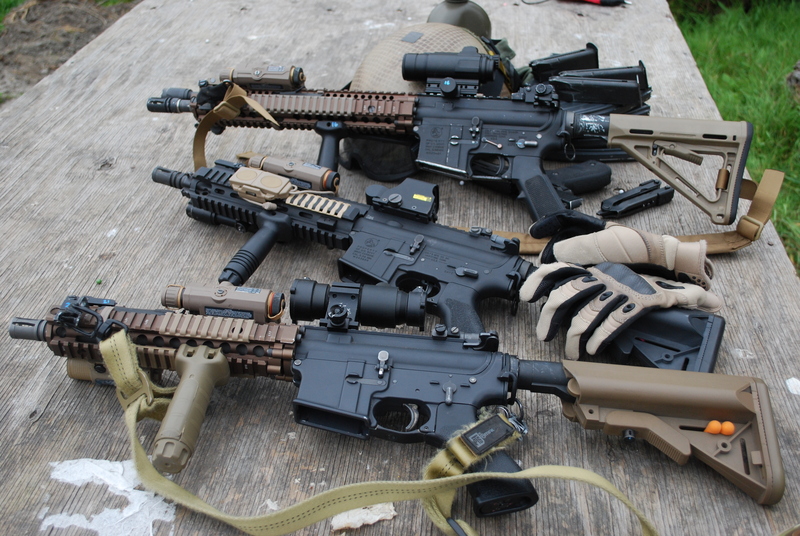 Something I always pushed as an upgrade from standard M4A1 plastic handguards was the Magpul PTS MOE handguard, when I was working at Airsoft Gear. The MOE handguard allows for greater flexibility as there are modular attachments that you can purchase for it, including rail sections, vert grips, sling mounts, light mounts, and pressure pad fixtures. I spotted that PTS (an Airsoft division of Magpul) released a mid-length gas system version of the MOE handguard a few months back; this intrigued me as I’ve always been a fan of the look of mid-length gas systems on AR builds, as well as the length of a 9″ handguard. In my opinion, the MOE advantage is the weight saved. Like many of the new railed handguards coming out on the real-steel market, the MOE handguard allows you to place rail sections wherever you see fit – you don’t have unnecessary rail sections already permanently affixed to the gun, and this also allows for greater customization to the user’s preference. The flexibility of the attachments out there means that I can only attach things that I need – I don’t even have to deal with flashlight rail mounts attached onto rails – I can bolt the flashlight mount directly onto the handguard (or I could even bolt some weapon lights out there directly onto the handguard). 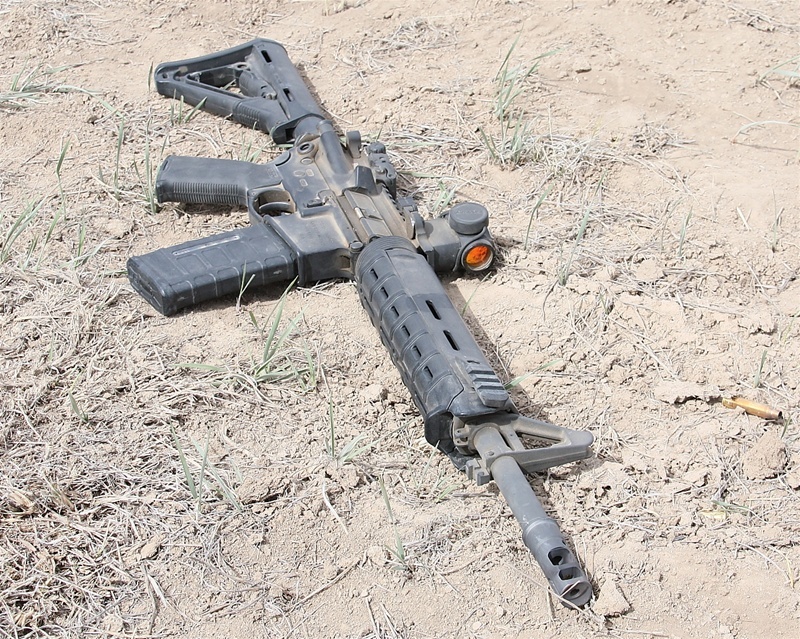 The fact that the MOE handguard is plastic as versus metal means even more weight is saved. Mind you, it may or may not feel quite as solid, but I think I can live with that. MOE handguards are designed with a different profile and shape than your usual RIS/RAS/handguards. 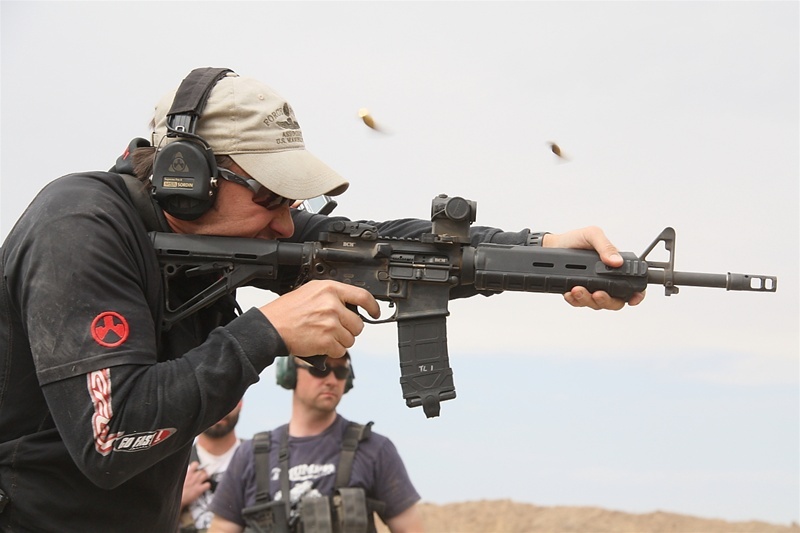 Though the profile is not for everyone, I actually find it to be quite comfortable – the grooves on the bottom provide low profile reference points for me, while the “tab” at the front of the bottom handguard acts as a hand stop for me. I am a thumb over bore kind of guy, so the triangular shape allows the corners of the handguard to fit right into the web of my hand. Pictures taken from calguns.net forums. I’ve always been a fan of hard holsters. Being able to quickly draw and re-holster my sidearm has been one of the biggest cool-factors in my gear, in my opinion. Mag pouches that are lined with kydex/polymers/etc are super cool high-speed gear bits, as they give the operator the ability to do away with noisy velcro lids, or bungee cord going over the mag that tends to get caught on stuff. When I look at military photos that feature strong-side profiles,I first try to figure out what holster the soldier(s) is carrying. 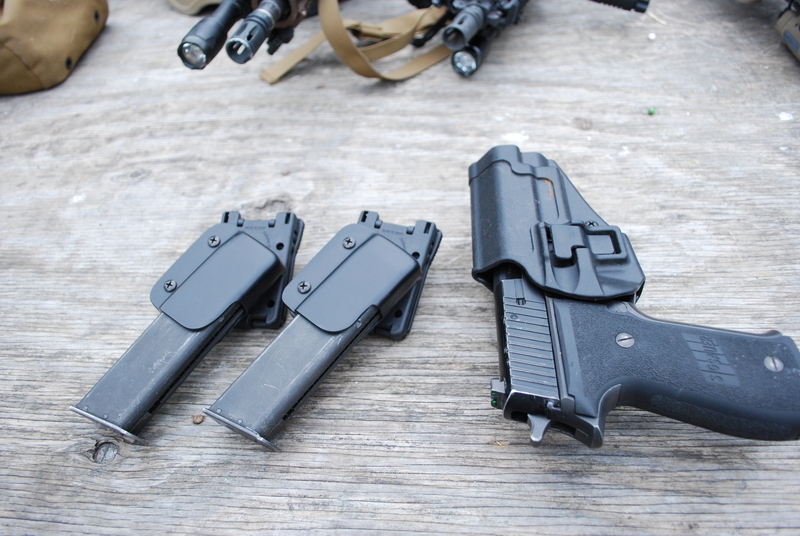 Yeah… I’m kind of a mag pouch/holster junkie in that sense. The following is a quick overview of some of the plastic stuff I clip onto my belt. I’ve been running a set up like this for a few months now, as I do have a very similar set up for my MEU(SOC) pistol. (gun pictured with Beta Project AK PMags with ranger plates from ehobby as per Juicy’s entry below, as well as a paracord wrapped stock for extra coolness points). 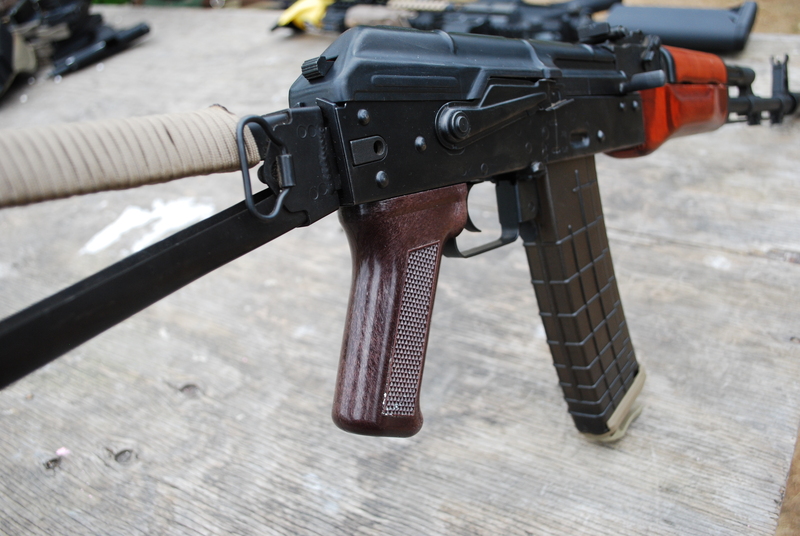 I’ve always been a “Western” gun guy; I very, very briefly owned a Galil, but all my other guns have been ARs, G36s, SCARs etc… That being said, when Airsoft Gear got in a new shipment of LCT AKs, I couldn’t resist adding one to my collection. For starters, the gun is very, very solidly built. There’s no wobble at all in any of the parts from stock to flashhider/compensator. The thing feels like a tank. The body is made of a solid metal (no pot metal here) and the real wood hand guard is nice and authentic looking; a far cry from other Chinese clone brands. Performance wise, I was quite impressed with how it performed out of the box. I’ve always been a tinkerer who rarely games guns in stock form – I usually toss in a new tightbore or hop-up rubber before firing my first shot through the gun, but on the advice of Juicy I decided to give it a go right out of the box. Boy was I pleasantly surprised. The gun shot right around 400fps stock, which means I didn’t have to mess with downgrading the spring. It also meant that I now had a full auto gun (my other three guns are all 425-450fps DMRs). With 0.28g Calibre Six BBs, groupings were surprisingly tight on full auto and more than adequately accurate on semi; I’d say maximum combat effectiveness was 175-185 feet, with the ability to hit targets at ~200 feet with some luck. Rate of fire and motor responsiveness were about what you’d expect from a stock gun. I think I’ll eventually toss a tightbore and perhaps a high-torque motor in there, but that’s about it… the gun is a solid performer out of the box and I’ll probably keep it stock until something breaks. The quality of the internal parts is certainly above average, as is its field performance. The real draw, however, is in the external quality. Excellent build quality with solid materials makes for a very authentic looking AK that can take a beating and keep on firing – just like the real thing. 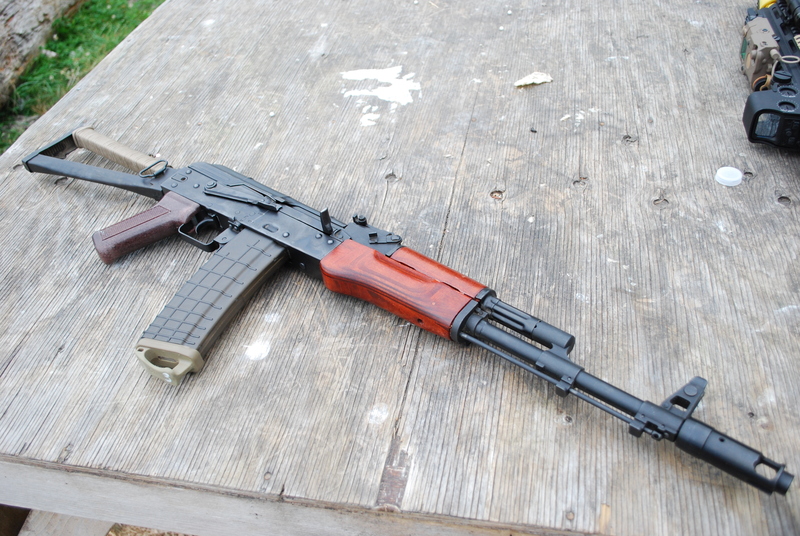 I’m a firm believer in the fact that AKs shouldn’t look pretty; they’re meant to look dirty and used. So my very first game day, I went and dragged it through the gravel in the parking lot. The gun didn’t go through that ordeal unscathed – I actually lost the semi function on the gun when a small bit of sand lodged itself into the gearbox’s cut-off lever. I guess I should have closed the selector lever and put a mag in the gun to keep the dirt out. 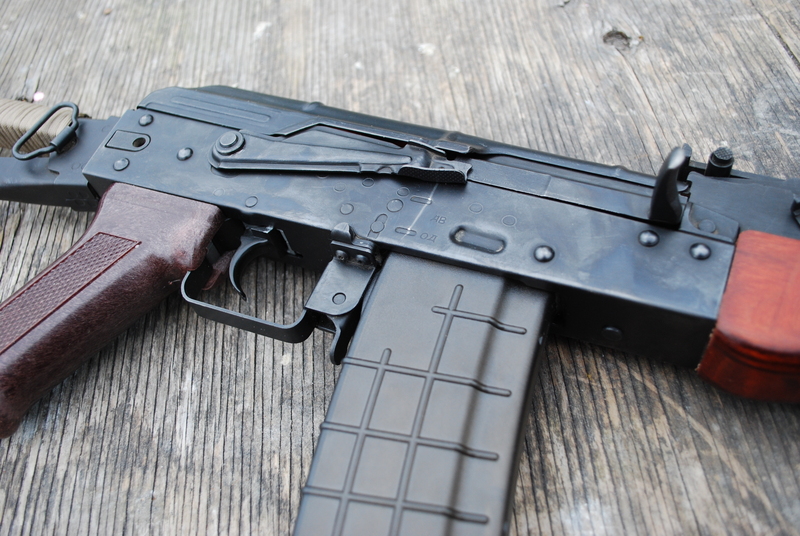 But that was a minor fix, and now the gun looks worn and used… just the way an AK should. I still need to get used to the mechanics of the AK platform after having spent years on AR-type guns. My reloads are clumsy as hell and I’m still not a fan of AK ironsights… but I’m more than happy with my purchase. You would be too. 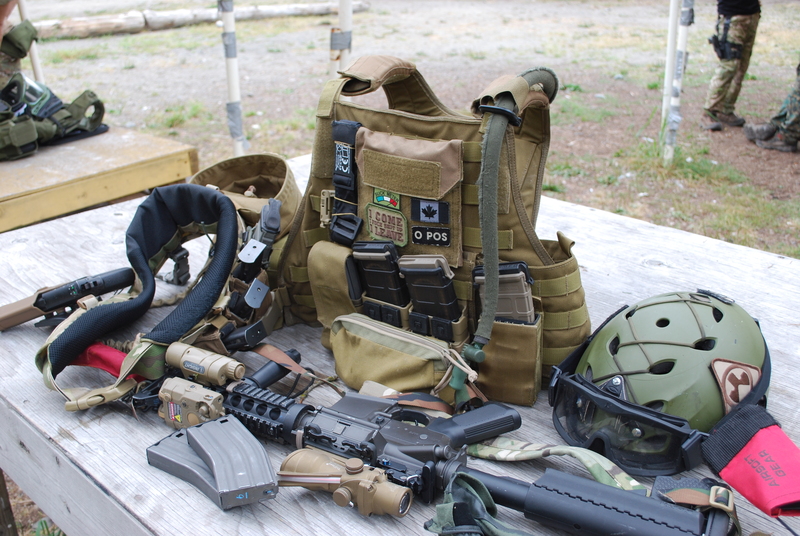 I generally use this CIRAS set up in conjunction with my MARSOC impression. IFAK is located on the CIRAS due to ERB (fanny pack) representing that. 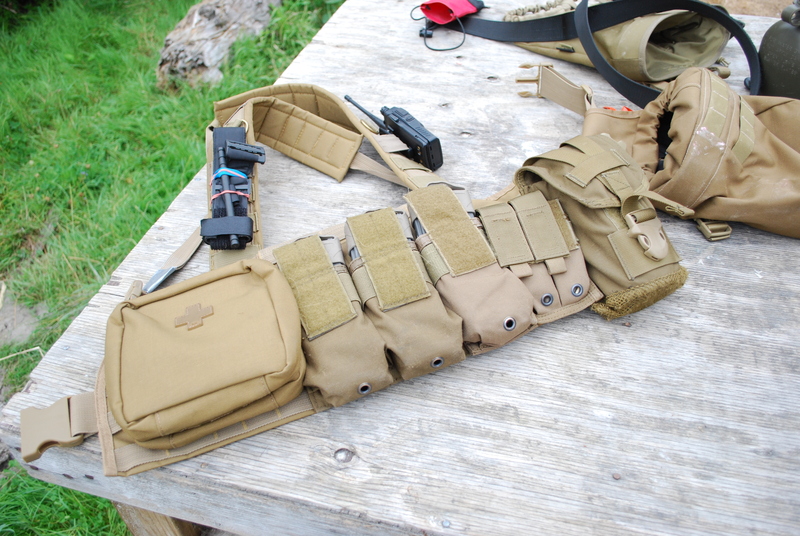 This set up is more or less a grab and go rig – I can carry enough loaded magazines, hydration, communication equipment and small accessories to last me a whole day on the field, if need be. If you are an Airsoft player, you may notice that I’m not carrying a radio. That’s right – frankly, my radio (a United Star AN/PRC-148 clone) is quite heavy and I’d just rather not tote that around on my Flyye Plate Carrier set-up as I usually wouldn’t end up using it. The paracord dealio on the Pro-tec helmet is most definitely inspired by the War Sport “War Bungee” product – I just don’t actually need to carry anything larger than a pen or a pair of gloves or a kill/dead rag, so I wouldn’t be benefiting at all from using bungee.